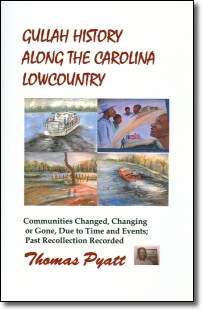 I’ve finished my first book about Gullah: Gullah History Along the Carolina Lowcountry by Thomas Pyatt. This slim little book is pleasurable reading; it’s like having a quirky great-uncle telling you family stories. A great first introduction to life as it once was, and still is, in Gullah communities in South Carolina. So, on to the next few weeks. I wanted to wind down the year with something a little closer to home and I was presented with the perfect subject. I guess it makes sense, but when you tell most Americans you’re reading about Georgia they don’t automatically think of a country. They think of the other one – you know: Atlanta, peaches, Gone With the Wind. I can do that; I grew up in THAT Georgia – Savannah, to be specific. The Gullah are African Americans who live in the Lowcountry region of South Carolina and Georgia, which includes both the coastal plain and the Sea Islands.Historically, the Gullah region once extended north to the Cape Fear area on the coast of North Carolina and south to the vicinity of Jacksonville on the coast of Florida; but today the Gullah area is confined to the South Carolina and Georgia Lowcountry. The Gullah people and their language are also called Geechee, which some scholars speculate is related to the Ogeechee River near Savannah, Georgia. The term “Geechee” is an emic term used by speakers (and can have a derogatory connotation depending on usage) and “Gullah” is a term that was generally used by outsiders but that has become a way for speakers to formally identify themselves and their language. The Georgia communities further identify themselves as either “Saltwater Geechee” or “Freshwater Geechee” depending on proximity to the coast. The Gullah are known for preserving more of their African linguistic and cultural heritage than any other African-American community in the United States. They speak an English-based creole language containing many African loanwords and significant influences from African languages in grammar and sentence structure. Properly referred to as “Sea Island Creole” the Gullah language is related to Jamaican Creole, Barbadian Dialect, Bahamian Dialect, and the Krio language of Sierra Leone in West Africa. Gullah storytelling, cuisine, music, folk beliefs, crafts, farming and fishing traditions, all exhibit strong influences from West and Central African cultures.